Hedge Fund Blogger.com: Top Hedge Fund Holdings | What are They Buying? Top Hedge Fund Holdings | What are They Buying? 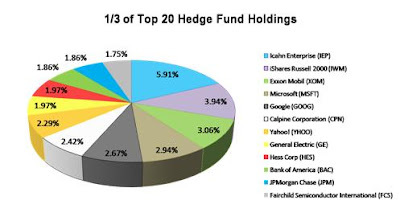 As of July 1st 2008, it appears that hedge funds poured money into the technology and service sectors. According to TickerSpy.com, the 20 most tracked hedge funds on the site had 27.9% of all holdings within those two sectors. The quarter-over-quarter results presented by TickerSpy.com showed holdings and changes in holdings as of July 1st 2008, as compared to the quarter earlier. These holdings are based on TickerSpy’s data, which shows the top 15 holdings of each hedge fund quarter-over-quarter. Total equity holdings of the 20 most tracked hedge funds amassed to $91.4 billion dollars, up from the previous quarter by $9.76 billion or 12%. New positions in equities totaled $9.54 billion, while existing positions saw a net inflow of just $219 million (net inflow: all money flowing into existing positions less all money flowing out of existing positions). Of the over 200 top holdings of hedge funds, nearly $25.5 billion or 27.9% were in either the technology or services sector. Which stocks? 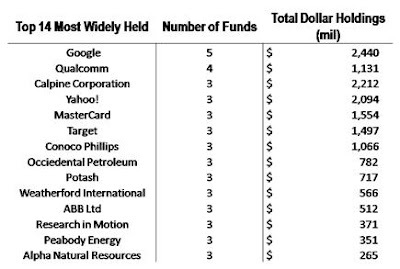 Below is a chart detailing the top 25 holdings by dollar amount that were seen in the portfolios, as well as a pie chart showing the top twelve stocks that made up over one-third of total fund holdings. However, some companies such as Icahn Enterprise are held by only one fund (Icahn Associates) and the large dollar amount slightly skews the accuracy of the holding data. 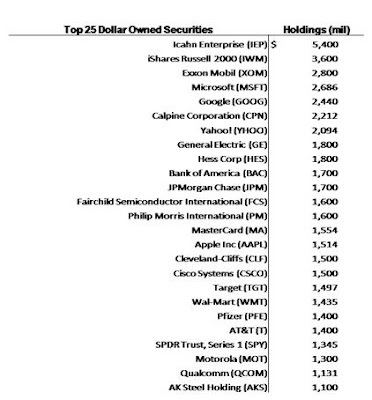 So I also compiled the 14 most widely held securities, determined by the number of funds that held them, as well as the dollar amount of the holdings. To review our Hedge Fund Tracker research please click here. To review our 13F Hedge Fund Securities Analysis work please click here.